Distance 1.9 miles (3.0 km). Grid reference SX208509 to SX224515. Park your car at the Crumplehorn car park above Polperro and walk down to the harbour to commence this walk. As you near the harbour bear to your left heading for the old bridge and the small Tourist Information Centre. Keep left following the signed route 'Talland Bay 1 mile'. Pass the Shell House and the unusual Hope Cottage as you wend your way up above the harbour along what is known as The Warren. Continue climbing passing the 'Watchers' Bed & Breakfast guesthouse - incidentally noted in the SWCP Association Guidebook - and six benches to enter the area known as Reuben's Walk. Pass the NT marker and climb the metalled path looking below as you reach 'Dinas Bal' to see a miniature lighthouse. Pass a seat as the path becomes more natural climbing for a few more metres. Rame Head and Prawle Point (Devon) come into view as the path begins to level out. Pass the stone marker stating that you are ¾ mile from Polperro and 1 mile from Talland. Note the changes in distance between the two villages - a classic case of 'Cornish miles!'. Bear right as signed at the fork in the path. Drop gradually down now taking care on the slaty sections if the ground is damp. Pause at the War Memorial at Downend Point for photographs if you wish. Use the granite bench if required. We were lucky enough to see a pod of FIVE Common Dolphins heading east towards Looe about a mile offshore. Their speed and grace cutting through the water made us quite envious! After your short break continue down the steps looking across to Talland Bay and the Hore Stone at Hendersick. Note the two white landmarks near the church - these are the western end of 4 nautical distance markers. Pass the NT omega for Talland Cliffs noting that Polperro is now 2 miles to the west?. Proceed down the tarmac road until you reach a waymark post pointing off to the right. Leave the road and drop down steps to follow the rather steep path down onto Talland Sands. Explore the beach and note the curious purple slates last seen near Polzeath, Padstow. The eastern beach here is known as Rotterdam Beach, I don't know why. Stop here to complete this stage or just pause for a picnic if you are continuing on to Looe. 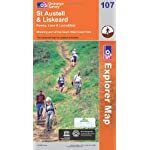 An excellent guidebook for the area is 'Around Looe, Polperro & Liskeard - Landfall Walks Book No.14' by Bob Acton. It may be a little dated but is very informative, please be aware though that it is quite hard to track down.